Unfortunately, coping with trauma on your own can be an impossible task. As resilient as our psyche can be, there are situations in life that push us to the limit of our abilities to cope - violence, abuse, death of a loved one, chronic illness, suicide in the family, war, natural disasters, separations, loss. If you or someone in your family is trying to cope with trauma, you may wish to make an appointment. To learn more about the treatment of trauma, read the blog posts below that originally appeared on my Practical Psychoanalysis Blog for PsychCentral. One of the most common underlying problems to depression and anxiety that I encounter in my practice is the experience of psychological trauma. Many of my clients come to therapy because they struggle with forming and maintaining relationships with others or because they suffer from symptoms of severe anxiety or depression. What I find time and again is that, often, the underlying issue causing both of these symptoms finds its roots in the experience of prolonged childhood trauma in unhealthy, abusive and difficult relationships to others. Trauma is a subjective experience. What is traumatic for one person is not necessarily traumatic for another. What's traumatic depends on the person's ability to cope with stressors and changes in their environment, which is usually a combination of temperament, genetics and intelligence. This is why in psychoanalytic psychotherapy we value the individual experience and try not to put people into pre-fixed categories. Trauma is not always about a single event. Just because you never experienced childhood sexual or physical abuse or any other single traumatic event, doesn't mean that you were not traumatized. Growing up with an emotionally abusive parent can be just as traumatic and sometimes even more traumatic than being punished or neglected physically. Psychological trauma is often harder to name and has a much more negative impact on a person's well-being than physical trauma. For example, a child may choose to lie to DCFS that their father beats them every night because they are more scared of losing their parent, than being beat by them. There are life events that can be traumatic for people such as the birth of a child, a miscarriage, divorce in the family, the death of a loved one, immigration, war, disease in the family, etc. You might think that just because divorce, the birth of a child, miscarriage, illness or death are a part of life, we should all be equipped to handle them without an issue but these are MAJOR life events that change us dramatically. It is not unusual for people to experience such drastic life shifts as traumatic and there is nothing wrong with seeking professional help to address them in therapy. Trauma transmits across generations. I have spoken about trans-generational transmission of trauma before in the context of domestic violence and the cycle of abuse. But the trauma that transmits across generations can be other than physical abuse and abusive relationships. Often, sexual abuse can be traced back to multiple generations of men or women in a family that have gone through the same thing. Very simply put, unconsciously, people repeat with their children and partners what was done to them in an unconscious attempt to cope with it and to turn the passive experience of being traumatized into the active one of taking control. This is unique for every person based on their individual history. Trauma needs to be talked about. As human beings, we have feelings about things and it's important that we talk about them with others. Bottling things up is not helpful and often causes myriad of symptoms such as substance abuse, anxiety, depression, difficult relationships, etc. This is especially true for the communication between parents and children. Often, we choose not to say something to our kids, because we want to protect them or we think that they don't understand, but putting traumatic events into words validates the experience, makes it real and sets up an opportunity for the event to be dealt with. We cannot deal with things, if we don't talk about them. If you or a loved one have experienced trauma, it is important to find a professional, who you can talk to about it. "How do we begin the process of removing the layers of impact that childhood trauma has on us when it was so early in childhood that we hardly remember?" What a great question for psychoanalysis and psychoanalytic psychotherapy! Did you know that psychoanalysis is one of the best treatment methods of the effects of early childhood trauma on mental health? Why is that, you ask. Good question, let me explain. Psychoanalysts often work with what are called "difficult to treat" patients - patients diagnosed with borderline personality disorder, or any personality disorders, psychotic patients, highly anxious individuals or ones that no one else really wants to work with - the common denominator for all usually being trauma. #1. Psychoanalysis works with what is beyond language, what is unconscious: Oftentimes, the experience of early childhood trauma is beyond language; it is an unconscious and usually non-verbal, making it difficult to address with traditional talk therapy approaches. Psychoanalysis listens precisely for those difficult-to-put-into-words, unconscious experiences. #2. What was never expressed in language, reappears in the body in the form of symptoms: The impact of early childhood trauma is that much more pronounced later in life precisely because there have never been words to describe or capture the traumatic experience. Usually, in psychoanalytic psychotherapy, one can begin to unravel the layers of the experience, slowly and often through speaking about the current symptoms that bother you or your body, which may include anxiety, substance use, self-injurious behavior, psycho-somatic symptoms, etc. #3. Psychoanalysts work to listen for the meaning of the symptoms and do not try to shut it down unlike traditional psychiatry that aims at symptom relief: In psychoanalysis, we believe that there is a meaning behind each symptom, that the symptoms carries a message of an unconscious experience, often an early childhood experience that was traumatic and beyond words. We welcome the symptom in a trusting relationship between patient and analyst and we invite the symptom to speak of that, which was never spoken about before and which is hardly remembered. #4. Psychoanalysis makes use of the transference relationship that you develop with the analyst: When addressing yourself to an analyst or psychoanalytic psychotherapist, you may talk about early childhood memories, dreams or experiences that have left a mark on you and impact your life today. Usually, because the traumatic experience is beyond words and has never been spoken about, the only way that you, the patient, can speak about it is through what we call a re-enactment in the transference relationship that you will develop with your analyst. #5. Psychoanalysis listens beyond what is being spoken: Your analyst will listen beyond your words and take note of these re-enactments. What this means is that your analyst is an active participant in your treatment, not a mute, "blank screen" that many still seem to believe. Your analyst will say things, stress things, questions things and help you make sense of your actions, thoughts and behaviors. So, in the email that I mentioned, the person asked me, "What is the first step that we need to take to begin addressing the issue of early childhood trauma?" The first step is to gather up some courage, make an appointment with a psychoanalytic psychotherapist and just get started on getting to know them and building a therapeutic rapport. Be committed to the process and the rest will follow. Domestic violence and abuse are among the top precursors for developing depression and anxiety during adolescence and later in adult life. Sometimes the violence is between partners, other times it's between parents and children and often it's a family dynamic between all members of the household. There are different forms of domestic violence and abusive behaviors, some easier to define than others. Generally, any behavior that uses one person's power to exert control over another person's physical and/or emotional safety is considered abusive. Physical abuse, sexual abuse and emotional abuse are all preconditions for people to develop low self-esteem, body image issues, relationship difficulties, anger issues, substance abuse issues, severe anxiety, depression, bipolar and other psychiatric disorders in adulthood. In addition, it is not unusual for people, who grew up in abusive relationships and domestic violent environment to recreate this experience in adulthood and unconsciously choose a violent partner and recreate the dysfunctional home they grew up in. This is not putting a blame on anyone for anything. It is simply stating that trauma has its way of repeating itself from one generation to another (what we call transgenerational transmission of trauma), unless you put an end to it and address it in psychoanalysis or psychotherapy. 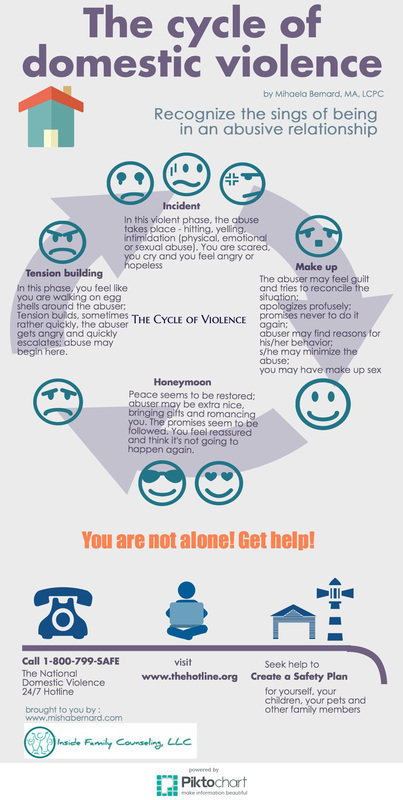 The cycle depicted in the infographic below, the cycle of abuse, repeats itself not only within the context of a single relationship but also across generations in an unconscious repetition from parents to children. So, if you are finding yourself in an abusive relationship, it is important to try and put an end to the cycle of abuse by removing yourself and your children from the environment and by finding a professional you can talk to. Don't be afraid and be the ONE to break the cycle! Make an appointment today. 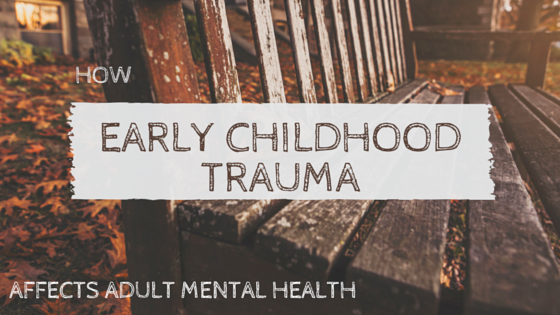 It doesn’t come as a surprise that the early childhood experiences of trauma will affect adult mental health later in life. And yet, somehow, many people continue to rely primarily on pharmaceuticals and medication management to address the impact of trauma on the human mind - a physiological solution to a psychological problem. Why is that? And how do we make sense of the real impact early childhood trauma has on adult mental health? I wouldn’t be telling you anything new if I simply reiterated the symptoms that the experience of any traumatic event may cause as a result - severe anxiety, fear, substance abuse, depression, manic and hypomanic states, promiscuity, self-doubt, low self-esteem, difficulties with daily functioning, rocky relationships, etc. However, I do want to stress one important consequence of early childhood trauma that affects every aspect of adult mental health and may be the reason why people prefer medication over psychotherapy as a treatment method - a profoundly wounded sense of trust in human beings. early childhood trauma not only affects our psychological well being and, if unaddressed, causes a myriad of mental disorders and symptoms in adulthood, but it also puts a giant hole in our ability to trust others and to form lasting and satisfying relationships. Of course, everyone is different and people respond differently to traumatic experiences. But for the most part, especially if the traumatic experiences occurred within the home, church or school environment, the very places that are supposed to provide safety and comfort, our belief in the goodness of people becomes highly questionable. Now, imagine (or maybe remember) that you were a child, who got severely beaten, criticized and humiliated by your father (this is just an example, to illustrate my point; it could be a mother, aunt, or uncle, etc. and it could be any type of traumatic experience). You learned how to be extremely careful about what you did and what you said so that not to piss him off, and most importantly, you became hyper vigilant as to his every move and facial expression in order to survive. Maybe you disliked your dad but you were even angrier with the rest of the family members for doing nothing to protect you. Now imagine that you are an adult struggling with severe anxiety and have a hard time maintaining stable relationships as a result. You want to do something about it but you really don’t trust anybody out there. Let’s say you have two choices - find a medication that will relieve the pressure and help you function or find a therapist to talk to. So how does early childhood trauma affect adult mental health? If there is one thing that I have learned from my experience working with people, who have experienced trauma, it is that humans are highly RESILIENT and STRONG creatures, who would do anything to survive. I try and build on that in psychoanalytic psychotherapy by focusing on building a safe, trusting and empowering therapeutic environment, in which people can begin to uncover the layers upon layers of unspoken experiences. Are you ready to take the next step for your mental health? Call for a free phone consultation today.